About Founded in 1871 as a land grant institution, the University of Arkansas is classified by the Carnegie Foundation among the top two percent of universities in the nation with the highest level of research activity. Ten colleges and schools serve more than 27,100 students with more than 200 academic programs. University of Arkansas students earn nationally competitive awards at an impressive rate and represent 50 states and more than 120 countries. Located in the stunning Ozark Mountains of Northwest Arkansas, Fayetteville is home to the University of Arkansas campus, known for its spectacular views and ample green spaces. Fayetteville is considered one of the country�s finest college towns, and the surrounding northwest Arkansas region is regularly ranked one of the best places to live in the U.S. Some of the nation�s best outdoor amenities and most spectacular hiking trails are within a short drive of campus. About the Department/College: The Department of Mechanical Engineering offers BS degrees to approximately 550 undergraduates with an average high school GPA of 3.82 and participates in the programs of the University Honors College. The MS and PhD programs serve approximately 40 graduate students. The faculty includes 2 NSF Career Awardees and produces over 30 publications per year. Annual research expenditures are approximately $2.24 million. 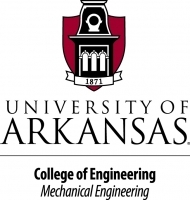 For further information, please see the department web page at http://mechanical-engineering.uark.edu/. The College of Engineering consists of eight departments that offer BS degrees in nine disciplines, MS degrees in ten disciplines, and a PhD degree in Engineering with several concentrations. The undergraduate enrollment in the college currently stands at over 3,000 and the graduate enrollment stands at almost 900. The college has 103 tenured/tenure-track full-time faculty associated with it and generally has externally funded annual research expenditures of approximately $20M.